Students off to top universities as they collect standout results. 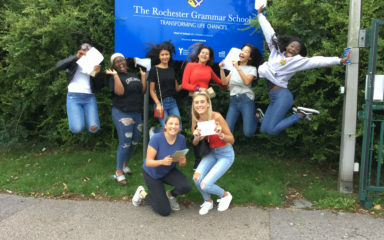 Students at Rochester Grammar School (RGS) are one step closer to the career of their dreams today – after they collected top results in this year’s A Levels. The school maintained its track record of success in one of most challenging years to date, with reforms across many subjects. Nearly three quarters of students achieved A*-B grades, and 18 students celebrated all A* or A grades. The students’ fantastic results have seen them win places at some of the best universities in the country – including Imperial College London, Exeter University, Durham University, University College London, Kings College London, and Bath University. Charlotte Newton, who received A*A*A* and will study Maths at Durham University; and her twin sister Gemma, who received AAB and will study Computer Science. Lucy Maycock, who received A*AA and a D2 in Global Perspectives Cambridge Pre-U. Lucy will study Law at Nottingham University. Roshini Bains, who received AAA and a D3 in Global Perspectives Cambridge Pre-U, and will study English at Exeter University. Annie O’Neill is particularly delighted to be accepted to Greenwich University to study Midwifery – having worked tirelessly to achieve this first step towards her dream career. Five students have secured places to study highly competitive courses of Medicine and Dentistry at top universities. RGS’s excellent results at A Level follow hot on the heels of its success in this year’s International Baccalaureate (IB). Students achieved world-class results in the IB – with a third achieving an outstanding 39 points or more (eight points above the world average and equivalent to gaining four A*s at A level), and students off to top destinations such as Cambridge University. 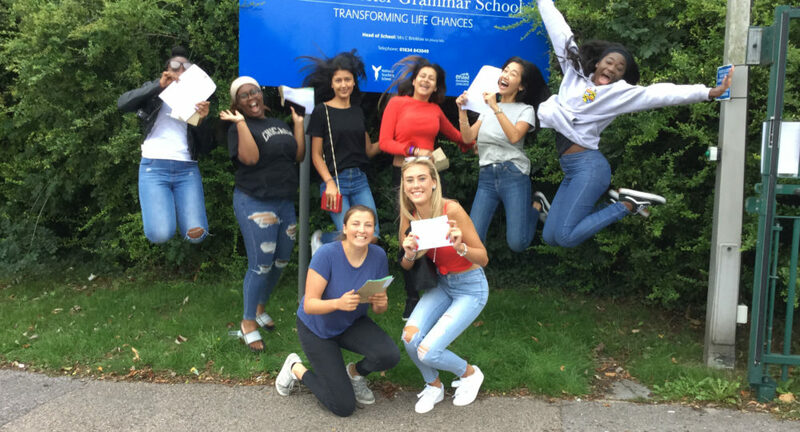 “We are so proud to see our A Level students collect another set of fantastic results this year. It has been brilliant to witness them open their envelopes and reap the rewards of their tireless work and dedication. “Their achievements are truly impressive, and I would like to congratulate this year’s cohort warmly. I can’t wait to see what they will go on to achieve next.